Woke up, stayed in bed, saw a gecko above my head. He was upside down, lifting his leg like a dog. How strange. Then he pooped and peed, and it landed, inches from my face, on the sheet. So I stayed where I was, while he walked across a beam, and looked at the creatures, hidden in the woodwork; the alligator, the Klan Girl, the dog who becomes a human face with a cigar stub, the mama and baby bird, the crazy killer fish. Some day I hope to photograph and paint them, using a light box. Two nights ago the moon was wreathed in a pastel swirl of clouds, soft gold, periwinkle blue, pink, silver and lavender. It looked like a tropical painting. It lit up the farm as we ghosted about, the dogs, my husband and me. I have been sick for most of the month of March. 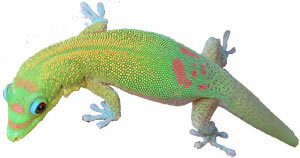 But this morning, with the gift of the gecko, I knew, no matter what, I must get up and write this down. The opening lines sent the Beatles song of the same time tempo and subject playing in my head. Then finding out you’ve been ill made me worried. The gift of the gecko making me laugh. All the shadow stories of the future photo subjects making me think of the beautiful way art shares the world without the barriers of time and space. Feel better get well. Love to all.